Winter 1 and Travel Club Team has rolling registration until November 12. Winter 2 registration open until January 1. Winter 1 and Winter 2 are developmental, fun track and fitness training programs for children age 3-14 (pre K - 8th grade). All skill levels welcome. Winter 1 has 6 training nights. Winter 2 offers 3 training clinics and 3 home, friendly community track meets. Our home meets are in the Moorestown HS Athletic Center in Moorestown, New Jersey. Many families enroll in both Winter 1 and Winter 2. 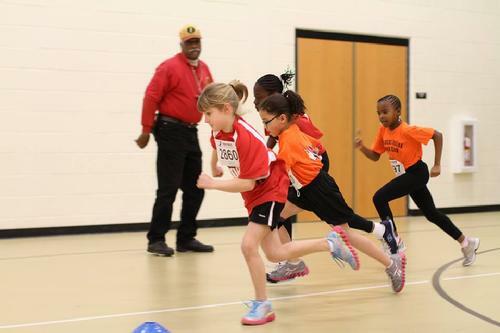 Children are coached in sprinting, hurdles, relays, throwing events, jumping and conditioning. Both Winter 1 and Winter 2 athletes will have the option to compete in regional AAU/USATF track meet. Advanced elementary and middle school athletes may want to consider the World Athlete Indoor Club Travel Team instead just Winter 1 or Winter 2. Athletes competing in the home meets must purchase a World Athlete racing shirt (youth sizes are $20 and adult sizes are $25). Purchases racing shirts and spirit gear (shoe bags, hoodies and practice shirts) here Racing shirts purchased in previous sessions can be worn. The World Athlete Indoor Travel Team is for athletes looking for more challenging training and a competitive, regional meet schedule. Our high school and middle school club athletes typically join us from schools that do not sponsor indoor track teams; however, athletes from all schools are welcome to register. Children younger then 6th grade can enroll but parents should speak to our coaches about the program first. There is usually 1 practice per week from November through February. The club team competes in about 3-4 meets per season in Pennsylvania, New York and/or New Jersey. Depending on the meet, there will are modest, additional entry fees (usually $6-$12 per event entered). Also, USATF membership will be required for some meets. Annual membership is $20 for youth athletes. Go to this link to register for USATF annual membership. Team athletes must purchase a World Athlete racing shirt (youth sizes are $20 and adult sizes are $25). Purchases racing shirts & spirit gear (shoe bags, hoodies and practice shirts) here Racing shirts purchased in previous sessions can be worn. Payment plans and - based on availability - some partial tuition relief funds are available for the club travel team. Please discuss this with our coaches since the online payment system cannot process these plans.